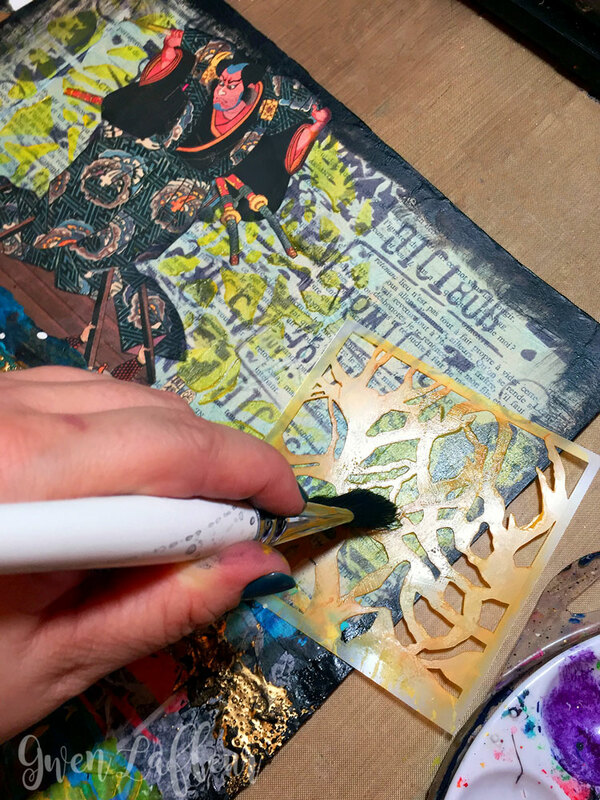 I love combining stencils and collage with in my mixed media work, especially when I also mix in a variety of acrylic paints and mediums and embossing powder. 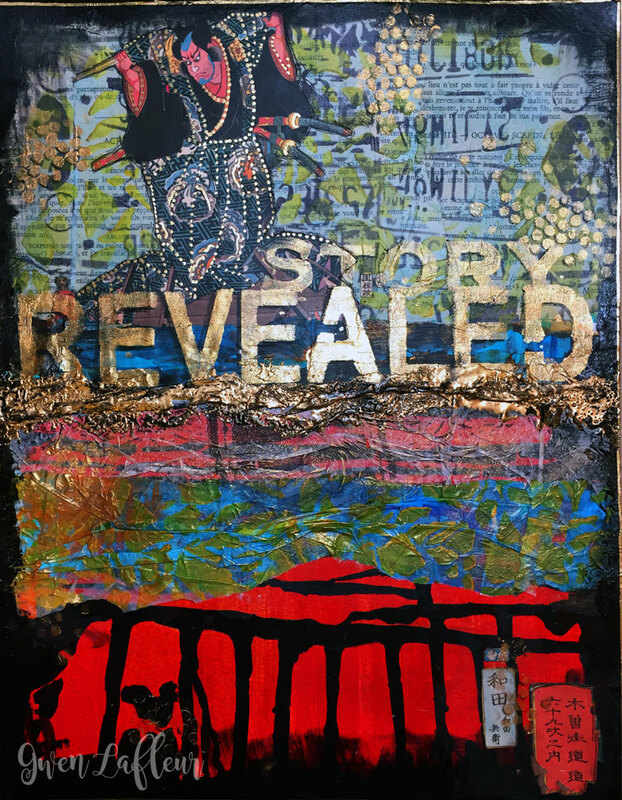 For this piece I combined all of those elements for a vibrant and textural mixed media collage. I took a few pictures along the way so I could share an overview of my process on this piece. To start, I used a sheet of 11" x 14" heavy-weight mixed media paper that already had a solid painted background on it. I collaged some vintage book text on the top section, then I stenciled the 6x6 design from the January 2016 StencilClub collection over and over on a piece of white tissue paper using a permanent black ink pad. 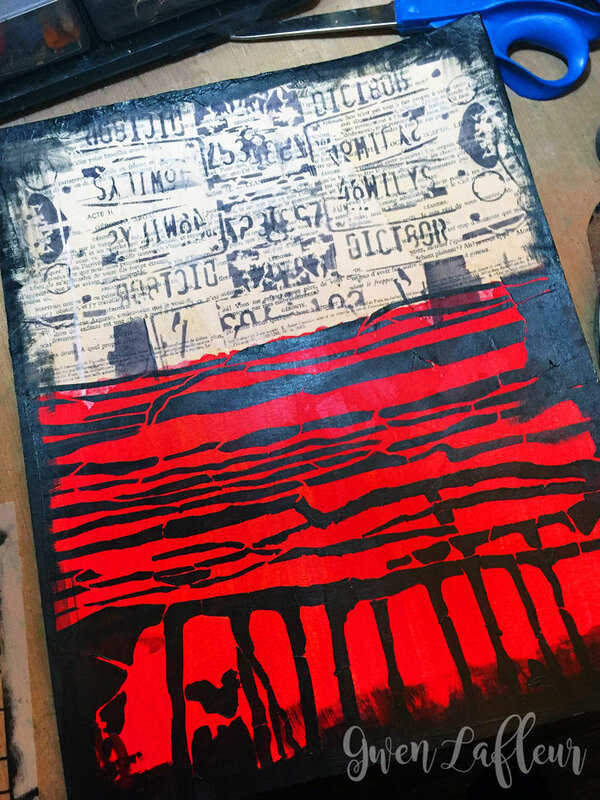 Next, I collaged the stenciled tissue paper over the book text, then used the 9" x 12" from the same StencilClub collection and stenciled with some black paint on the bottom. I also used a paint marker to cover the bridges in the stencil design and make it look like solid paint drips. 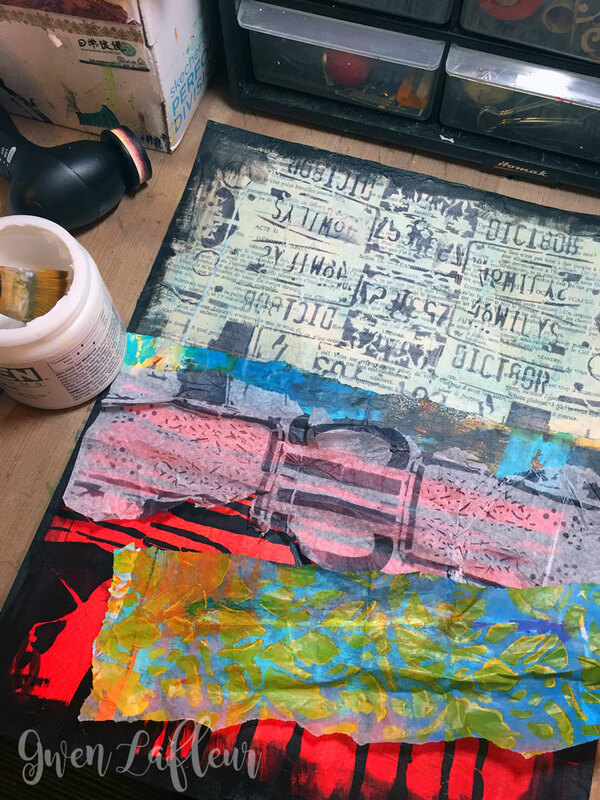 To start to build up the layers of collage and bring in some texture I took some sheets of painted collage papers from my stash along with more of my stenciled tissue paper and started to adhere those in strips across the center of the page using gel medium. I also stenciled with the 4" x 4" from the January 2016 StencilClub collection on some deli paper that already had paint on it. 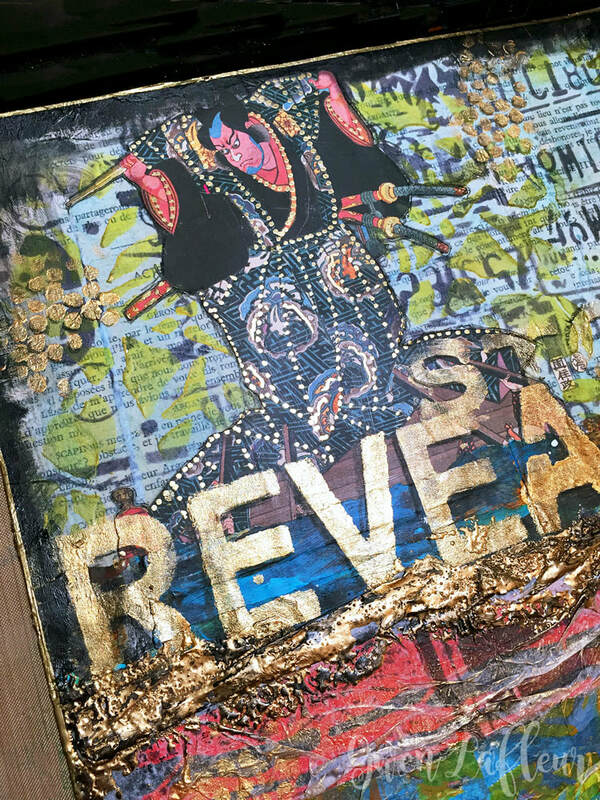 I added strips of the stenciled deli paper to the collaged area with more gel medium, then used some gold embossing powder to put a line of gold texture across the middle. I made sure to sprinkle on the embossing powder while the gel medium was still wet, then heated it immediately - this makes the powder bubble because of the wet polymer underneath; it adds a fabulous texture to the piece. To complete the collage ​I added a Japanese block print cut from a book and stenciled around the image with the 4" x 4" stencil from my StencilClub kit. Finally, I pulled out the November 2015 StencilClub collection by Seth Apter to add a title with gold paint. Because of the iridescence of the paint, the words almost become invisible in certain light which I thought was pretty cool given the title of the piece. 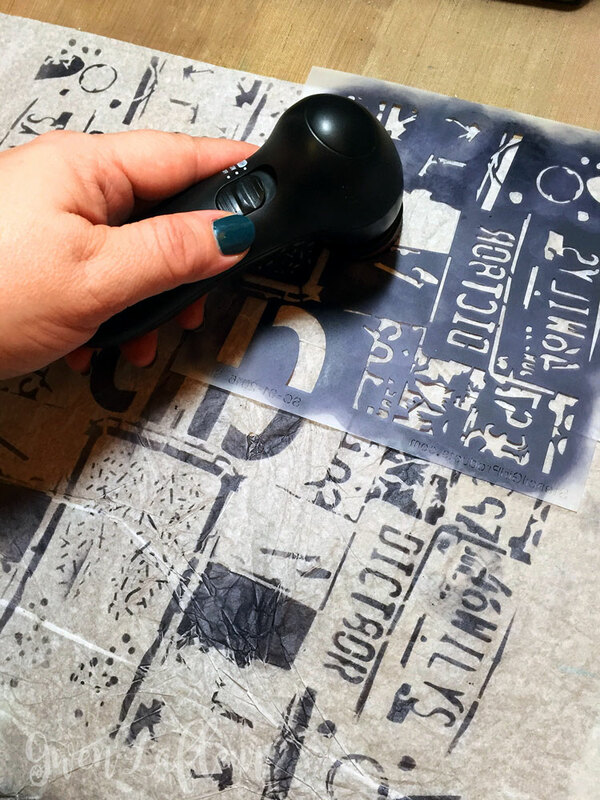 I love the way all of the layers of stenciling, collage, and embossing powder combine together for interesting and highly textural layers.